Tetsuharu Kawakami is a legend of Japanese baseball, whose .377 batting performance in 1951 stood as the Central League record for more than thirty years. A red bat his trademark, he was known as the “Batting God”—dageki no kamisama. He went on to become an extremely successful manager for the Yomiuri Giants in the late ‘60s and early ‘70s, winning nine straight titles. Some observers view Ichiro Suzuki (picture) as his legitimate successor, the “Second Batting God.” But according to this article in the New York Times, there is one skill Kawakami was famous for that Ichiro cannot duplicate: seeing the ball stop. What would account for the feeling that time has stopped? I don’t know about stopping, but I can offer a general hypothesis for time slowing. Assume that the human sense of time—the “atomic clock of the brain”, as it were—is related to the operational speed of the brain as it engages in cognitive activities. If the brain operated faster, more processing would occur in the same amount of time as measured by a clock on the wall, thus leading to a slower internal sense of time. So perhaps Kawakami’s synapses fired faster as the pitch raced from the pitcher’s hand toward the batter’s box. Is that possible? Or, perhaps wider swaths of Kawakami’s brain were recruited to process, in parallel, more information about the pitch than in the case of lesser batters, yielding greater computational output, which might translate into the same sense of time slowing. This could be an interesting research project, if we can find subjects who can reliably slow their sense of time. Neuroimaging of such people should show discernible patterns that could serve as a starting point for understanding this phenomenon. Such research could also help us in our development of theories of neurotheology, since we know that religious experiences can also involve a similar sense of time slowing. This entry was posted on Tuesday, June 14th, 2005 at 10:35	and is filed under Uncategorized. You can follow any responses to this entry through the RSS 2.0 feed. You can leave a response, or trackback from your own site. Batting God is perfect for him. 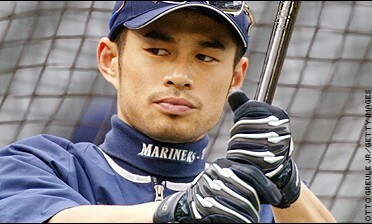 He is the best japanese baseball player ever.